If there was a list of dangerous foods, the apple pie would probably sit near the top. I don't mean the ones which come as a whole round pie, but those which are in the packet, hot and toasty from your nearest fast food chain. Usually Mcdonald's. I used to really like getting one together with my fast food meal, the word apple had me convinced that I was at least getting a serving of fruit in my unhealthy junk fix. hahah, who was I kidding. But underneath the seemingly harmless crusty top, lies a boiling mixture of sweet apples and sauce which is just waiting to unleash its fury and.. Ok so I'm getting carried away haha. But it's true! If your tongue has ever been burnt by an apple pie, you would understand my frustration with it. Because of the scalding filling, I had no choice but to nibble carefully around the edges and slowly slurp up the filling. 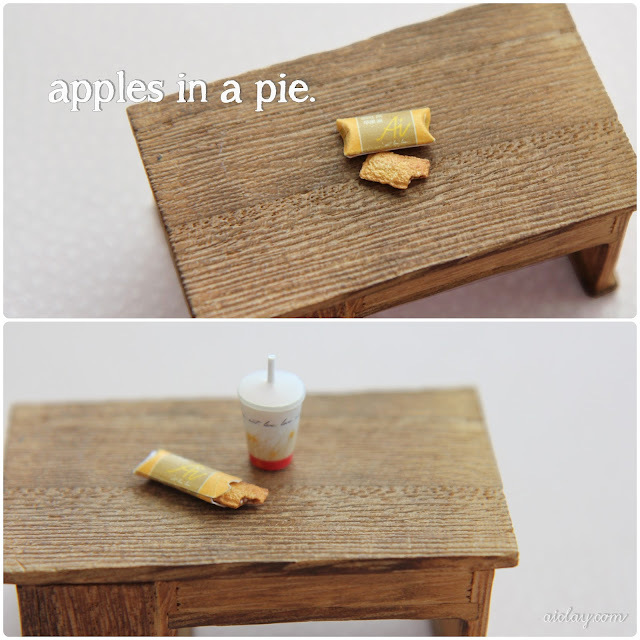 Miniature apple pie handsculpted by me. I forgot to do my usual finger balancing act, but it's tiny like the rest of my works. Damn, and I really just want to bite into that crusty pie without fearing for my tongue. Update on the Rose Cupcake Workshop, thank you to all the registered participants! There are still some slots left, so if you have a few hours to spare on the 5th of May (it's a public holiday!) and you would like to make your mom smile, do join us! and OMG i know exactly what you mean about burning your tongue! .__. they shouldn't have made it so hot in the first place >:C aargh you make me want to buy some of that now hahaha! Cindy: hahaha precisely right!! It's almost a sin to let it cool down, but my tongue trembles with fear everytime i lift the hot apple pie hahaha. It can be difficult to remember when looking at these photographs that you are actually seeing a miniature. My mom used to love the McDonald's apple pies.